It took the Dow Jones Industrial Average and the S&P 500 basically twenty five years (give or take a month) to recapture the nominal 1929 secular highs. With Japan's Nikkei now trading well into its twenty fifth year since its secular peak in 1989, we thought we would take a quick comparative look at the two most cited deflationary spirals (as weighed by their respective equity market performances) and contrast them with the most recent European deflationary trend as expressed by Spain's IBEX index. 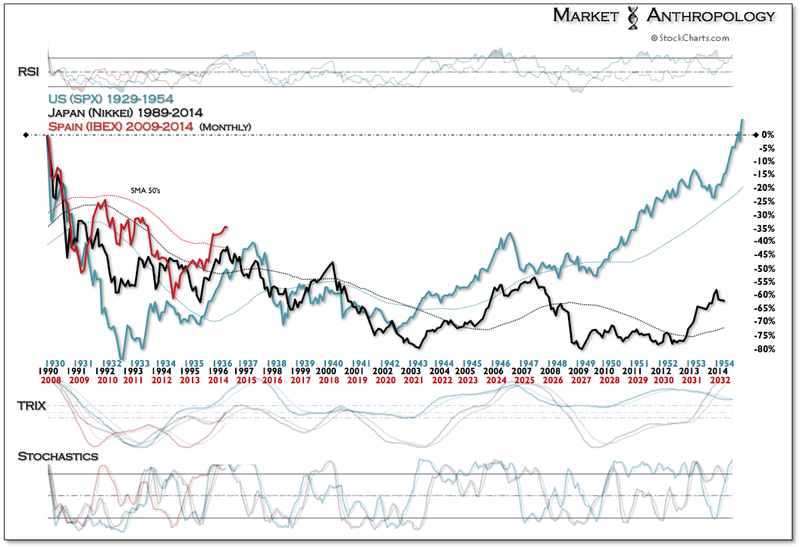 Both the SPX and the Nikkei contracted ~ 80% below their secular peaks. 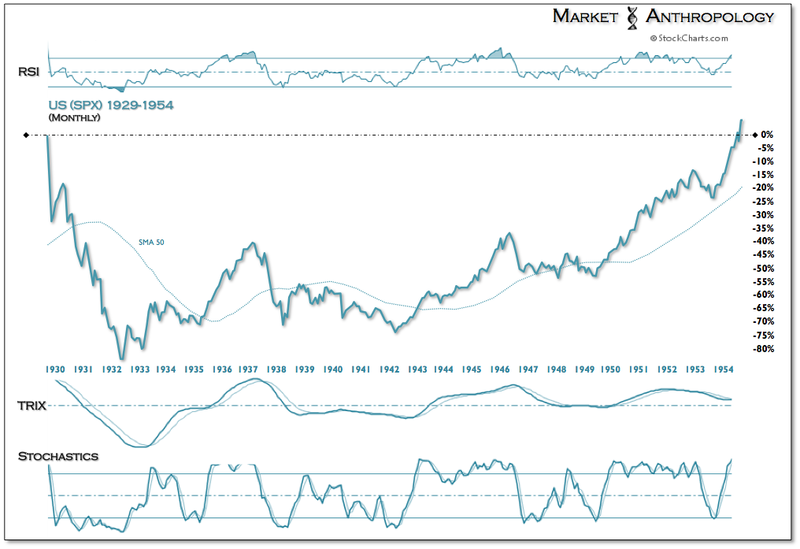 In the US, the equity market collapse was acute and reached a secular low less than three years from the 1929 high. For Japan, the contraction was more prolonged and eroding - reaching a secular low ~20 years from its 1989 high. The massive bounce (+300%) in the SPX extending from the 1932 low up to the cyclical high in 1937 "normalized" the two performance trends through the back half of the first decade (post peak). 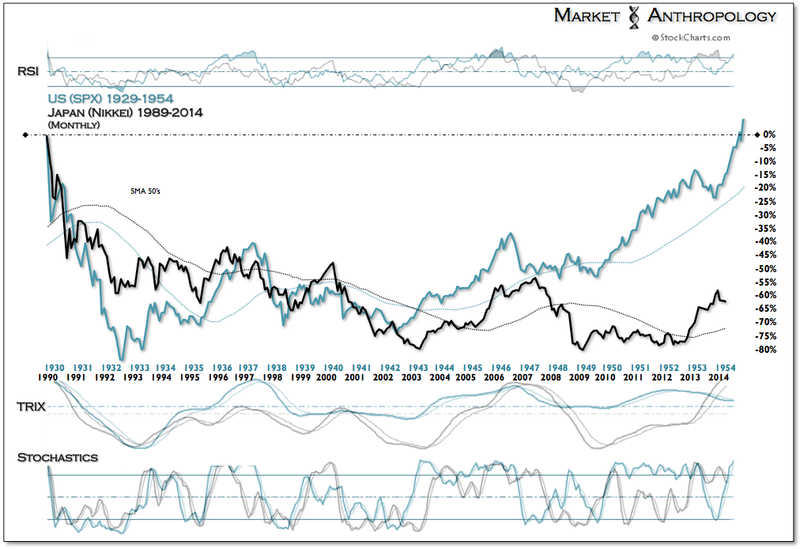 Over the next 10 years the SPX firmed and diverged from Japan's prolonged performance slump that many financial historians believe resulted from the US joining the Allied Powers in WWII at the end of 1941; therefore, hastening the underlying deflationary conditions at home. The comparative performance profiles diverged even further with the most recent financial crisis that swept the globe in 2008/2009 and maintained pressures on Japan's pernicious bout with deflation. Our general outlook for the Nikkei this year has been that the rally that began with the commencement of Abenomics at the end of 2012 became stretched to a relative extreme and that the breakout leg for Japan and perhaps its perennial battle with deflation would occur at a lower level (technically) and after another subsequent correction. That correction has materialized this year with the Nikkei underperforming almost every major market in 2014. 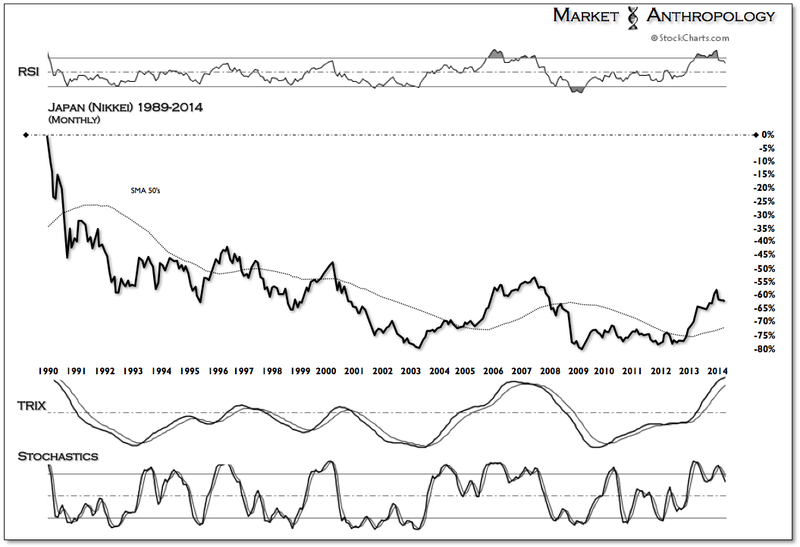 While the Nikkei has come under pressure in its twenty fifth year since making a secular high at the end of 1989, Spain's IBEX has trended higher, albeit traversing between positive and negative for the year on several occasions. It has essentially trended with the SPX but with a higher beta return. Our longer-term expectations this year have progressively become more bearish as the structure of both indexes (IBEX & SPX) have shifted from a flagging and consolidating pattern to what we suspect could become a cyclical top for both markets. 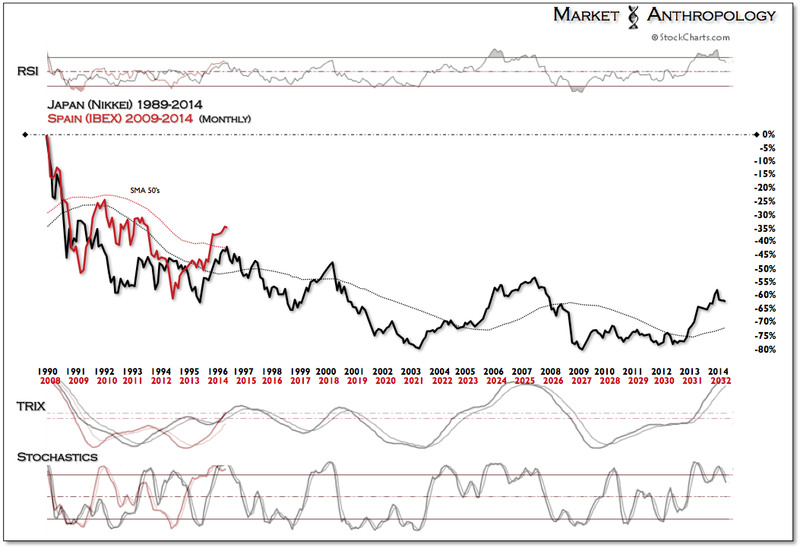 With that said, we are far more bearish on the long-term prospects for Spain and the IBEX and see great similarities - both from an economic and market perspective, to Japan over the last quarter century. Although it is likely too early to put on both sides of the trade, an alluring pairs trade (long Japan/short Spain) between these two deflationary cousins may have considerable open road to run as one market transitions out of deflation as the other cycles back in.